First edition in English, 1916. "The little mud-walled settlement that Abdul Aziz [ibn Sa'ud] recaptured for his family in January 1902 was remote from the twentieth century in almost every sense. Western map-makers could not even put a latitude and longitude on the place; Riyadh was a dot placed capriciously somewhere in the central wilderness. In 1865 one Englishman had ventured across the 250 miles of desert that separated the town from the Persian Gulf. But Lieutenant-Colonel Lewis Pelly was only the fifth European known to have visited Riyadh n the entire course of its recorded history, and the next Westerner did not arrive until 1912" (Lacy, Robert. The Kingdom, p. 55). That Westerner was explorer Anders Christian Barclay Raunkiaer who, in 1912, led an expedition sponsored by the Royal Danish Geographical Society through Iraq, Kuwait, and Saudi Arabia. He recorded his experience in Gennem Wahhabiternes land paa Kumelryg (Copenhagen, 1913). The journey was fraught with tension. "Days spent lying in camp like this are by no means pleasant ... As day follows day, I see myself observed with ever more hostile eyes ... As things are, the rumor of an infidel's approach will spread to Shakrah and other towns in South Nedjd long before I arrive there myself; and the more malignant that rumour, the smaller the probability of escape from my adventure with a whole skin at the end." By 1912, Al Sa'ud (the House of Sa'ud) was well on its way to reconquering the Nadj, Arabia's central province and the family's ancestral home, from the Al Rashid, allied with the Ottomans, and their most formidable enemies. Originally spreading outward from Riyadh, their home town, in the mid-Eighteenth century, Al-Sa'ud, then led by Abdul Aziz ibn Sa'ud, the patriarch of modern Saudi Arabia, then began its campaign toward rule over the entire peninsula and nationhood. Their military conquests brought religious conquest with them. In 1744, the Sa'ud family allied itself with Muhammad ibn Abdul Wahhab, The Teacher, a qadi, a religious judge. Wahhab, born in 1703, had dedicated himself to God, studying the Koran and interpreting it in its most literal and strict sense. His rigid, doctrinaire and dogmatic strain of Islam did not endear him to his neighbors. Muhammad ibn Sa'ud, the ruler of Al-Dar'iyah, the family's initial power base, and the first member of the House of Sa'ud to emerge from the desert into history, invited Wahhab to preach in his territory. Strict reform followed, and thenceforth followed wherever Al-Sa'ud led. Wahhab was the John Calvin, Martin Luther, and Brigham Young of Islam in Arabia. The House of Sa'ud and Wahabi have remained firmly allied since that fateful meeting in 1744, the families early joined through marriage. The political ambitions of one man met the religious ambitions of another and resulted in conquest and political cohesiveness through a singular vision of religious purity and strength by getting back to the fundamentals, which resonated with the Arab people. In 1912, then, the House of Sa'ud was on the move and the Wahabi strain of Islam with it. Undisguised hostility toward foreigners, scarcely seen curiosities, was acutely heightened by strict disdain for the corrupting influences they brought with them. While Abdul Aziz ibn Sa'ud had contact with the British for assistance against the Ottomans, he was, perhaps the only Arab to be inviting to an obvious infidel. In 1916 Raunkiaer's Gennem Wahhabiternes land paa Kumelryg was translated into English as Through Wahabiand on Camel-Back; the British, in the midst of WWI, wanted to know all they could about Arabia, a region of strategic importance - the Arab revolt against the Ottomans, instigated by the British Foreign Office, was underway. (Central Arabia, while nominally a part of the Ottoman Empire, had gained de facto independence when Abdul Aziz and his guerrilla army chased the Turks out in 1906). The first edition of Through Wahabiland... (reprinted in 1969 by G. Routledge) has become an extremely rare book. OCLC/KVK records only two copies in libraries worldwide, at the British Library and at Oxford, and there have been no copies at auction within the last thirty-five years. Bonham's- New York is offering a copy, one of only an estimated 100 printed, at its Fine Books and Manuscripts sale , 10 October 10, 2011. It is estimated to sell for $6000 - $9,000. RAUNKIAER, Barclay (1889-1915). 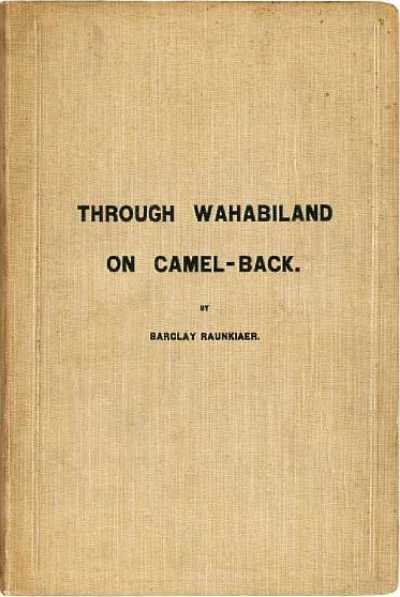 Through Wahabiland on Camel-back: An Account of a Journey of Exploration in Eastern and Central Arabia undertaken at the instance and the cost of the Royal Danish Geographical Society in 1912. Cairo: Government Press, 1916. Scarce first edition in English of Gennem Wahhabiternes land paa Kumelryg (København: 1913). Octavo. viii, 140 pp. Original tan cloth. Image courtesy of Bonham's, with our thanks. The Kingdom: Arabia and the House of Sa'ud by Robert Lacy. A History of the Arab Peoples by Albert Hourani. The Arab Mind by Raphael Patai.